Ok, Saturday morning didn’t have any actual gaming. I had left it open in hope that Chris and I could get a couple of games in before my 1:30 rpg. So on to that. 1:30pm – Fiasco with Jason Morningstar. This was the first game I signed up for when I registered. I saw that Jason was facilitating a Fiasco and I really wanted to see how he played the game. I was not disappointed. And as a bonus, Chris had been able to sign up that morning. 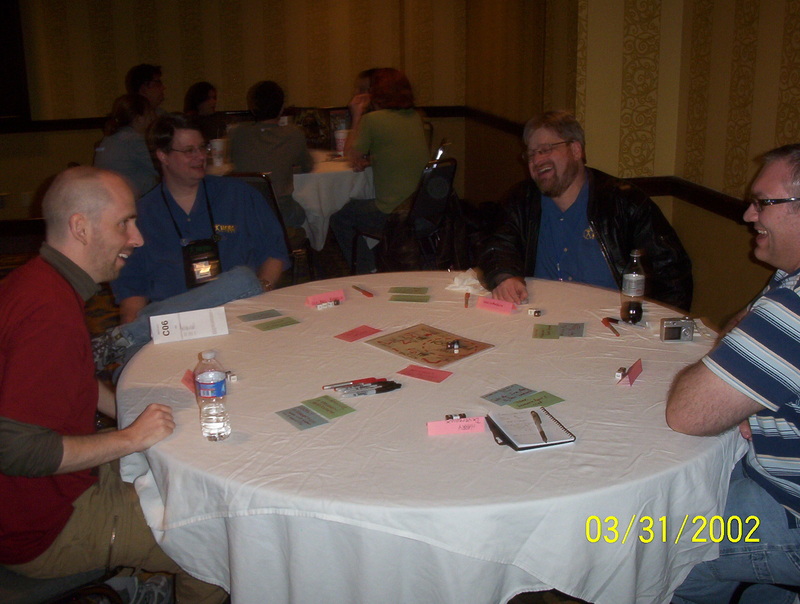 The players were Jason, Chris, Steve Long and Darren Watts from HERO Games (see part 1), and myself. Jason had most of the playsets available and we decided on Los Angeles 1936 – crime noir. 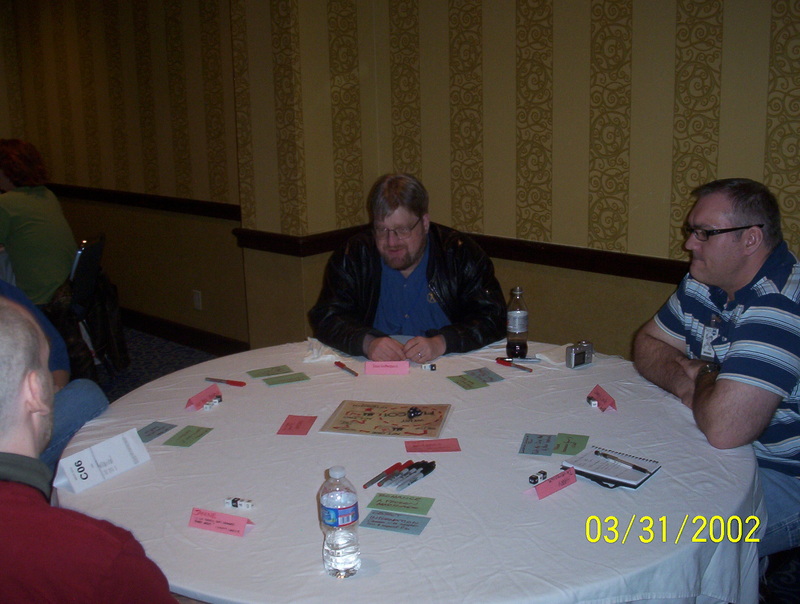 I was playing Harry Devereaux, a semi-dubious insurance agent. I was in a frozen marriage with Janine, played by Jason. Steve was Sergeant Phil Resnick, a crooked cop under Janine’s thumb. Darren played Lola LaMontagne, Resnick’s daugher in law and the sultry singer at The Eiffel Tower Club. And Chris played Lenny Leslie, retired cop now owner of The Eiffel Tower Club. The game started with Janine and Sergeant Phil and we found out that Phil and Janine had known each other in high school. Janine had something on Phil and was using him to do her dirty work. Lola and Lenny had a scene in her dressing room next. Then Harry got a visit from Lenny. Seems Lenny had come into possession of some evidence that Harry had a local motel burned down for the insurance money. Lenny forced Harry (not that difficult a job) to upping the insurance policy on The Eiffel Tower Club to ONE MILLION DOLLARS. We found out just how frozen Harry and Janine’s marriage was next. The game continued with Harry becoming the punching bag of the story. He fell for Lola and she kind of for him at first. Then Janine appeared at their date at The Brown Derby with some pictures of Lola and Harry in the throes of passion. Harry blew up at Janine and her hypocrisy. Seems Janine had her own affairs over the years that Harry had turned a blind eye to until now. Janine was very rich by the way. Harry stormed out. Lola slipped out, highly embarrassed. Later she and Janine had a little talk where we learned that Lola was a lot like Janine. She was manipulative and willing to do almost anything to get her singing career launched. One of those things being letting Harry be her sugar daddy. Janine didn’t let her off the hook and told her to stay away from Harry. But Janine did find that she liked Lola and said she would help her. Though her kind of help Lola didn’t realize she didn’t want. Meanwhile, Lenny has had a change of heart. Lola reminds him of his true love, the one that he corrupted, who became a tarnished flower. Who happened to be Janine Devereaux. Anyway, Harry gets another visit from Lenny. Lenny has Harry change the policy to make Lola the beneficiary. Meanwhile, Janine wants Phil to torch The Eiffel Tower Club. Phil is not too thrilled but has his own ideas about this. He pays Harry a visit. Phil wants Harry to change the beneficiary on The Eiffel Tower Club to … Lola. Harry is happy to comply, since he has already done so. Well, Harry returns home to find Janine waiting for him, drunk and packing a .22 rifle. She shoots him after letting him know that Lola and her club will be gone soon. Fortunately for Harry, Janine is a poor shot and even more so full of booze. He rushes to the club with a bleeding wound. While all this was going on, Phil’s son shows up at the club with the photos of Lola and Harry. He confronts her and she tells him that he’s a loser and to get lost. Lenny interrupts this domestic scene right before Bill (the son) whacks Lola. While all this is happening, Phil shows up, locks the club doors from the outside. He sets the place on fire and walks around to the back of the club. Harry shows up at the front to hear Lola screaming as the flames engulf the place. He runs around the back to see Phil. He begs Phil to help him get the doors open. Phil answers by shooting him point-blank. Harry falls and dies in the alley. Phil puts a bullet through Harry’s head just to be sure. But Phil’s plans get sacked because somehow Lola escapes and Phil gets tagged for Harry’s murder. Lola gets the money and her career. Oh, we forgot about Janine. Janine, burned out, turns the gun on herself and ends it. It was a really fun game. The players were top-notch and kept things interesting. Steve was great. His corrupt cop was nearly perfect. He was imaginative and fun. Darren’s Lola was spot on. Her turn was really neat. And Darren had some real rpg chops. Chris was fun as always. He played Lenny with a gravelly voice and gesturing with his hand as if always holding a cigar. He too is a good role player. I felt like I was the weak link. I didn’t get my character in hand for several scenes. It wasn’t until the scene with Phil that I figured out just who Harry was. After that I felt pretty good about how I played. It was really good to see Jason run the game. I needed to see how it is done. No, I don’t think you were the weak link at all. In fact, one of my favorite moments was when you stood up to Janine in the restaurant. That reaction/attitude was a brilliant choice for you to make about your character, and you did it seemlessly and very effectively. While the whole session was really good, I don’t know that anything surprised me as much as that did. I seem to always struggle with my character in games like this as well, and it was well into the game before I figured out what exactly were Lenny’s motivations in this whole Fiasco.